Make a splash this year without going overboard - literally - by accessorising yourself with the latest in trendy pool and beachwear when booking your next beach holiday. The humble pool float and beach inflatable may have once been associated with multi-coloured rings and cartoon prints for children but today they are a fun and practical way for everyone to relax in style on the water. From slices of pizza to gigantic pretzels to even a unicorn, these 7 colourful and wacky inflatables are guaranteed to raise a smile. Get your very own unicorn with this colourful and fun inflatable that will surely make you centre of attention on the beach or in the pool. With a rainbow-flick of a tail, long neck and - of course - a golden horn, the mythical unicorn inflatable is bound to bring any party to life. Perfect for the pepperoni and thin crust lovers, this tempting pizza inflatable will keep you dry if probably a little hungry! Available as a single slice for yourself or as an entire pizza to share with your friends, stay afloat as the ultimate topping on your favourite snack in comfort. Make a statement at your beach or pool party with one of these eye-catching floats, and you'll be the envy of your friends! A mouth-watering rendition of the traditional rubber ring, this giant inflatable doughnut is especially ideal for your children to enjoy the pool safely. With a delicious pink cream topping and multi-coloured sprinkles, this will be a sweet treat for the whole family to enjoy on holiday. If only real doughnuts came in this size! A pineapple-inspired float brings the right amount of tropical vibe to a summer pool party. Sit back, relax and order yourself a cooling Pina Colada to sip in fitting style. This all-time favourite German snack is the inspiration for the hottest new beach inflatable. The surprisingly practical pretzel inflatable is shaped into three rings, making it the perfect float to share a chat or a cocktail with your friends. Alternatively you could keep it all for yourself, we'd perfectly understand. Is there anything more refreshing than a juicy watermelon on a hot sunny day? This fruity float is the perfect slice of inflatable joy for you to relax the afternoon away at the beach or in the pool, while the bold green and red colours will ensure you stand out from your fellow holidaymakers. You may not find this behemoth in your average swimming pool but who could possibly resist having a go on this ultimate inflatable playground? With its climbing frame, floats and huge slide, this is the king of inflatables and the easiest way to recreate that thrilling waterpark experiences without the queues! So, these were some of our top picks for floats and inflatables of this year. 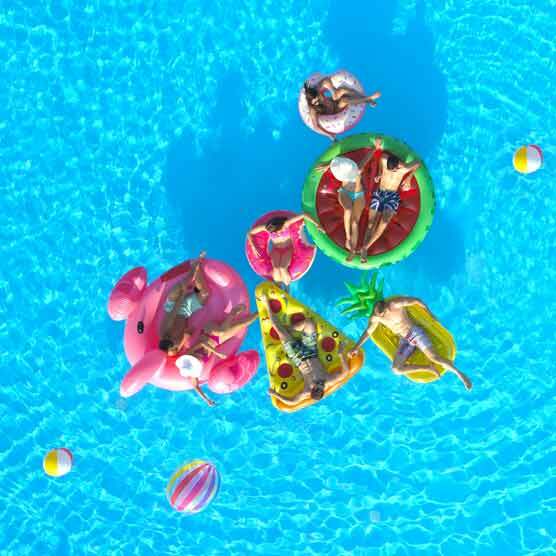 Whether you are taking a trip to a beach resort or just soaking up the summer sun at your backyard pool, these inflatables will please everyone from finicky teenagers to playful children. They might even bring out the child in you!